I must say that I never expected us at 10,000 Birds to receive an email asking us if we wanted to review a DVD made from a company dedicated to producing “children’s nature resources (from a Creation perspective).” After all, my views on creationism are pretty darn clear. Nonetheless, I thought it might be interesting and informative to review a DVD put out by Crowe’s Nest Media, a family owned and operated company, which is how I found a copy of Your Backyard: A young beginner’s guide to identifying 18 common feeder birds by sight & sound in my mailbox earlier this week. The DVD packaging features three cherubic children, a cartoon owl, and a Red-bellied Woodpecker. The only clue that the 58-minute long video comes from a perspective that is any different from any other nature video is a single sentence on the back of the case that refers to “close-up images of some of the Creator God’s most beautiful feeder birds.” While this unobtrusive sentence fragment might not seem that odd it is an important clue to what this video is about. Rather than intersperse the effects of a birding video being made from a mistaken and discredited perspective with the rest of the review I figured I would get it out of the way to begin with and then focus on the video itself. The video opens with the statement that the “presentation is designed to glorify God, the “Magnificent Creator,” of birds.” Bible verses show on screen at the beginning and end of the video. Every single species account includes at least one sentence in which gratuitous references to creation are made. Examples? Sure! Now that the religious portion of the review is out of the way we can get to the video itself. The eighteen species covered are divided into five groups by color (blue or gray, brown, red, black, and yellow or orange) and each species gets an account that is a couple of minutes long. This consists of footage of birds at feeders, on the ground beneath feeders, or perched in trees near feeders, a stop-motion animated owl named Professor Solomon superimposed over the screen imparting wisdom to the children, and a segment at the end, mercifully owl-free, where a range map is displayed and the kids go over bird vocalizations. The footage is fine as far as feeder footage goes and the segment with the range map where the kids explain how to identify the species being presented by ear is actually really helpful. The owl, on the other hand, is annoying, clumsily done, and distracting. Even my cats turned away from the television when the owl would come on screen, only to come back when it was only real birds. In between the different color groups of birds are several seemingly random segments. There is a stop-motion animation about John James Audubon, a paean to Ralph Bell (a long-time western Pennsylvania birder), another stop-motion animation about bird song, and a lesson on building a simple birdfeeder. The stop-motion animation is poor, just like Professor Solomon, especially the John James Audubon portion which includes far too much time on Audubon’s stop-motion (barely) animated feet. The part about Ralph Bell is nice, especially when an attempt is made to explain the value of his decades of banding birds on his family farm. The segment falls short of really explaining the importance of citizen science, however, and I can’t help but wonder if the anti-science perspective that creationism espouses is the reason. If your perspective on the natural world is fundamentally anti-science then how can you hope to explain scientific concepts? Overall, the video is fine for trying to teach kids about very common backyard birds of the eastern and central United States. That is, it is fine if you don’t have a problem with constant references to the creator god. The occasional inaccuracy by omission, like saying that adult Eastern Towhees have red eyes (there are subspecies with white), is not a deal breaker. 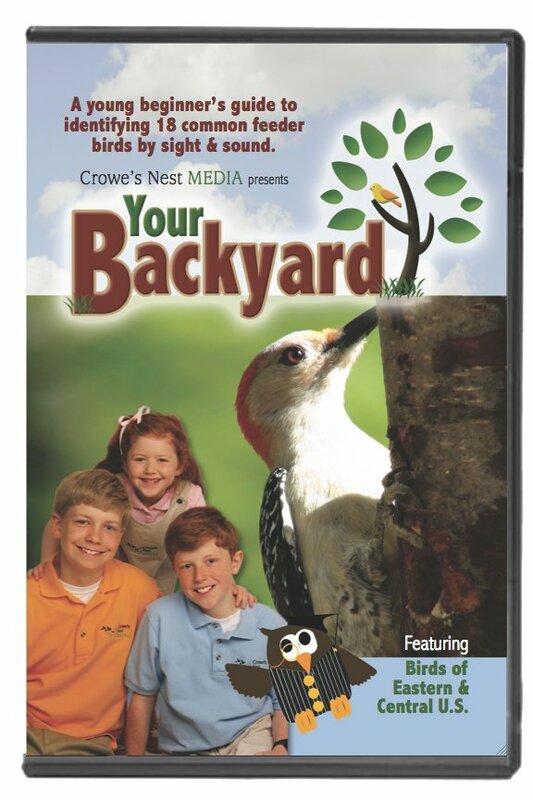 However, I honestly can’t see a reason to buy this video unless you think that using a video to teach your children about exceedingly common backyard birds is a better way to teach them then, you know, actually going out in your backyard. Also, unless you are trying to move your child in an anti-science direction there is no reason that if you are going to use a video that you would use one with an expressly creationist perspective. Great comment Arie! We think alike! In defense of your review of the “birding video being made from a mistaken and discredited perspective.” Science means truth. Creationist are not anti-science. We believe in truth and believe in operational science. Historical science “evolution” has been claimed as truth, but no one was here to observe it, it is a theory. knowledge, as of facts or principles; knowledge gained by systematic study. Creationist have no problem with that. I have no qualms with this blog. It is very informative and birds are birds and we all enjoy them. We just happen to believe they came into being by two different methods. I believe that God created them, you believe that they came by chance. That fact doesn’t make one person better or smarter than the other. I will still continue to read from your blog and enjoy it. @Kirby – I think you just proved the existence of Satan! @Lee – discussions of evolution vs. creationism tend to devolve into shouting matches, which I’m sure none of us want. 10,000 Birds has always addressed birds through the lens of science. I find it hard to believe that anyone offended by the mention of evolution could follow this site for long. @ Kirby – Why does Satan want my french fries? If you are going to play the semantics game, purchase a dictionary. Your understanding of the definition of the word ‘theory’ is flawed. It is also claimed that Mary was a virgin. WHO CHECKED? Did Mary get Gold, Frankincense, Myrrh, ~and~ a pelvic exam? What I get from this discussion, and Lee’s rundown, is that this blog clearly isn’t mentioning evolution enough. In the future, I expect at least two mentions per post and Pearl Jam songs don’t count.